Maybe if they stopped living in their parents’ basements and had to earn a living to support themselves they would shape up. Dogs are the truest, most sincere form of unconditional love, not to mention great wisdom about love. I can’t imagine a life without making art, but I’m worried about my partner. 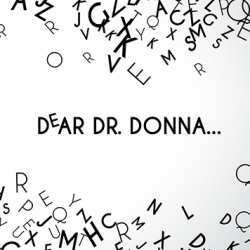 Dear Dr. Donna: What is the meaning of life? My mother loves cooking. She lives alone so she will cook a big batch of something and keep a little for herself and bring the rest to our house for our family to eat. Some of it is great, but many times we just don’t like what she cooks. My son is in 1st grade. I have recently separated from his father, so he and I are living without a Dad in the house. School started recently and while he says he loves school he completely falls apart when it’s time to go. I love fixing things—fixing problems, leading committees, volunteering for the needs of the community, etc., etc. The problem is everyone knows this and I can never say no. Dear Dr. Donna: My daughter is in an abusive relationship. Her husband is very controlling and there have been times when he has gotten physically violent with her. Dilemma: To Party or Not to Party? Dear Dr. Donna: Come Friday night, my partner just wants to don her yoga pants and curl up with a book and the cat. She would be happy to spend all weekend in a Netflix haze. Dear Dr. Donna: My problem isn’t a new one but it’s new to me. In fact, when others said they had this problem I just thought they were making excuses and procrastinating.